We know how to improve care and health to make it more effective, affordable and sustainable. We create greater health benefit for entire regions – in Germany as well as other European countries. 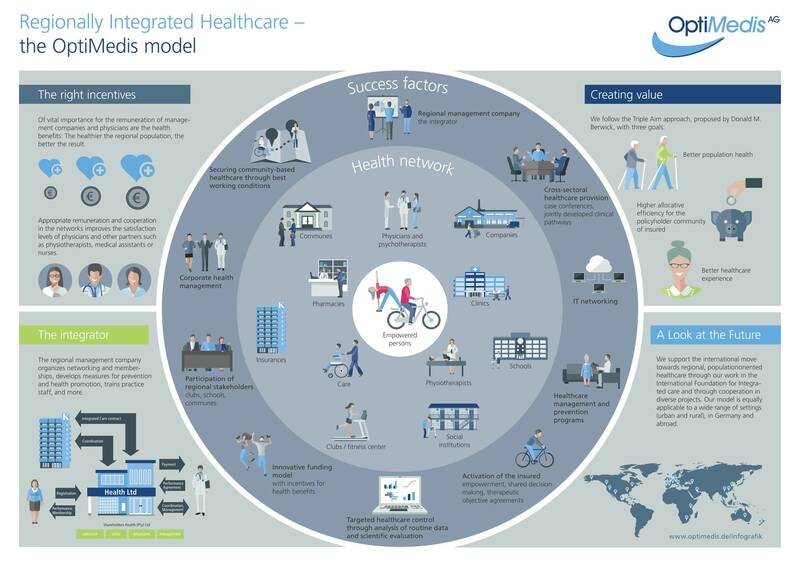 Together with regional medical networks, OptiMedis AG is building an integrated healthcare structure in which doctors, therapists, hospitals, pharmacies and many other partners work in association and overcome past constraints. They coordinate trea tment and can access all important information at a glance through the electronic network. Insured patients will be actively involved and motivated for early disease prevention and participation in health and care programs. Clubs, schools, businesses and local authorities in the region will also be involved. In other words, the focus is on the whole person and its environment. 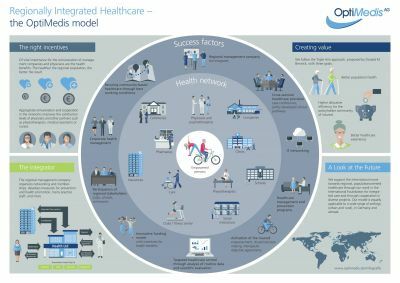 To see our model of Regionally Integrated Healthcare in an infographic, please click here. We’ve done it at Gesundes Kinzigtal in Baden-Württemberg. In 2014 new figures lead to an improved contribution margin for 2012 of "146 Euro per AOK-insured person, or 4.6 million Euro for all 31,000 AOK-insured persons in the region in regard to risk adjusted normal costs of care in Germany". That is, the actual cost of the insured were almost seven percentage points lower than expected costs. And recent evaluation of the PMV Research Group of the University of Cologne draws positive conclusions as well. The researchers found that there was a decline in over-, under- and misuse of healthcare in many indications in the Kinzigtal region, and at the same time they observed an increase in healthcare quality. We also work with committed medical networks, therapists and hospitals in other German regions. And together with partners from the Netherlands, we established OptiMedis Netherlands in 2014.